Tenofovir is a potent, first line therapy for the treatment of chronic hepatitis B. The drug has high efficacy with limited potential for resistance. It can be used even when resistance has developed to other antivirals used for hepatitis B. 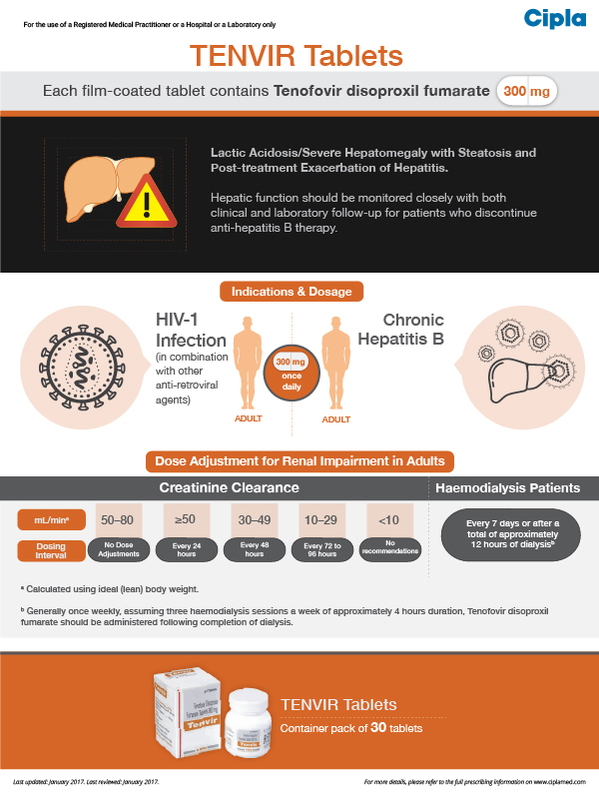 This infographic highlights the indication, dosing and administration for tenofovir in hepatitis B management. Lactic acidosis and severe hepatomegaly with steatosis, including fatal cases, have been reported with the use of nucleoside analogs, including tenofovir, in combination with other antiretrovirals (see Warnings and Precautions). Severe acute exacerbations of hepatitis have been reported in HBV-infected patients who have discontinued anti-hepatitis B therapy, including tenofovir disoproxil fumarate. Hepatic function should be monitored closely with both clinical and laboratory follow-up for at least several months in patients who discontinue anti-hepatitis B therapy, including tenofovir. If appropriate, resumption of anti-hepatitis B therapy may be warranted (see Warnings and Precautions). Tenofovir disoproxil fumarate is an acyclic nucleoside phosphonate diester analog of adenosine monophosphate. Tenofovir disoproxil fumarate requires initial diester hydrolysis for conversion to tenofovir and subsequent phosphorylations by cellular enzymes to form tenofovir diphosphate, an obligate chain terminator. Tenofovir diphosphate inhibits the activity of HIV-1 reverse transcriptase and HBV reverse transcriptase by competing with the natural substrate deoxyadenosine 5’-triphosphate and, after incorporation into DNA, by DNA chain termination. Tenofovir diphosphate is a weak inhibitor of mammalian DNA polymerases α, β, and mitochondrial DNA polymerase γ.
Tenofovir disoproxil fumarate is a water soluble diester prodrug of the active ingredient tenofovir. The oral bioavailability of tenofovir from tenofovir disoproxil fumarate in fasted subjects is approximately 25%. Following oral administration of a single dose of tenofovir disoproxil fumarate 300 mg to HIV-1 infected subjects in the fasted state, maximum serum concentrations (Cmax) are achieved in 1.0 ± 0.4 hrs. Cmax and AUC values are 0.30 ± 0.09 μg/mL and 2.29 ± 0.69 μg·hr/mL, respectively. In vitro binding of tenofovir to human plasma or serum proteins is less than 0.7 and 7.2%, respectively, over the tenofovir concentration range 0.01 to 25 μg/mL. The volume of distribution at steady state is 1.3 ± 0.6 L/kg and 1.2 ± 0.4 L/kg, following intravenous administration of tenofovir 1.0 mg/kg and 3.0 mg/kg. Effects of Food on Oral Absorption: Administration of tenofovir following a high-fat meal (~700 to 1000 kcal containing 40 to 50% fat) increases the oral bioavailability, with an increase in tenofovir AUC0-∞ of approximately 40% and an increase in Cmax of approximately 14%. However, administration of tenofovir with a light meal did not have a significant effect on the pharmacokinetics of tenofovir when compared to fasted administration of the drug. Food delays the time to tenofovir Cmax by approximately 1 hour. Cmax and AUC of tenofovir are 0.33 ± 0.12 μg/mL and 3.32 ± 1.37 μg·hr/mL following multiple doses of tenofovir 300 mg once daily in the fed state, when meal content was not controlled. Steady-state pharmacokinetics of tenofovir were evaluated in 31 HIV-1 infected pediatric subjects 2 to less than 18 years (Table 1). Tenofovir exposure achieved in these pediatric subjects receiving oral daily doses of tenofovir disoproxil fumarate 300 mg was similar to exposures achieved in adults receiving once-daily doses of tenofovir disoproxil fumarate 300 mg.
Tenofovir exposures in 52 HBV-infected pediatric subjects (12 to less than 18 years of age) receiving oral once-daily doses of tenofovir disoproxil fumarate 300 mg tablet were comparable to exposures achieved in HIV-1-infected adults and adolescents receiving once-daily doses of 300 mg. The pharmacokinetics of tenofovir are altered in subjects with renal impairment (see Warnings and Precautions). In subjects with creatinine clearance below 50 mL/min or with end-stage renal disease (ESRD) requiring dialysis, Cmax, and AUC0-∞ of tenofovir were increased (Table 2). It is recommended that the dosing interval for TENVIR be modified in patients with creatinine clearance below 50 mL/min or in patients with ESRD who require dialysis (see Dosage and Administration). Tenofovir is efficiently removed by hemodialysis with an extraction coefficient of approximately 54%. Following a single 300 mg dose of tenofovir disoproxil fumarate, a four-hour hemodialysis session removed approximately 10% of the administered tenofovir dose. The pharmacokinetics of tenofovir following a 300 mg single dose of tenofovir disoproxil fumarate have been studied in non-HIV infected subjects with moderate to severe hepatic impairment. There were no substantial alterations in tenofovir pharmacokinetics in subjects with hepatic impairment compared with unimpaired subjects. No change in TENVIR dosing is required in patients with hepatic impairment. For the treatment of HIV-1 infection in adult in combination with other anti-retroviral agents (such as NNRTI or PI). 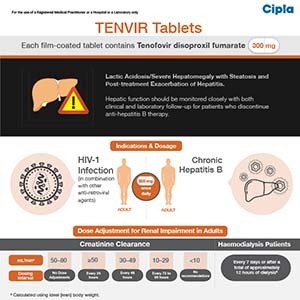 TENVIR is indicated for the treatment of chronic hepatitis B in adults. The dose of TENVIR is 300 mg once daily taken orally, without regard to food. In the treatment of chronic hepatitis B, the optimal duration of treatment is unknown. Safety and efficacy in pediatric patients with chronic hepatitis B has not been established. Significantly increased drug exposures occurred when tenofovir disoproxil fumarate was administered to subjects with moderate to severe renal impairment (see PHARMACOLOGY). Therefore, the dosing interval of tenofovir disoproxil fumarate should be adjusted in patients with baseline creatinine clearance below 50 mL/min using the recommendations in Table 3. These dosing interval recommendations are based on modeling of single-dose pharmacokinetic data in non-HIV and non-HBV infected subjects with varying degrees of renal impairment, including end-stage renal disease requiring hemodialysis. The safety and effectiveness of these dosing interval adjustment recommendations have not been clinically evaluated in patients with moderate or severe renal impairment; therefore, clinical response to treatment and renal function should be closely monitored in these patients (see Warnings and Precautions). No dose adjustment of tenofovir tablets 300 mg is necessary for patients with mild renal impairment (creatinine clearance 50–80 mL/min). Routine monitoring of calculated creatinine clearance and serum phosphorus should be performed in patients with mild renal impairment (see Warnings and Precautions). a Calculated using ideal (lean) body weight. b Generally once weekly assuming three hemodialysis sessions a week of approximately 4 hours duration. Tenofovir disoproxil fumarate should be administered following completion of dialysis. The pharmacokinetics of tenofovir has not been evaluated in non-hemodialysis patients with creatinine clearance below 10 mL/min; therefore, no dosing recommendation is available for these patients. No data are available to make dose recommendations in pediatric patients with renal impairment. Lactic acidosis and severe hepatomegaly with steatosis, including fatal cases, have been reported with the use of nucleoside analogs, including tenofovir disoproxil fumarate, alone or in combination with other antiretrovirals. Treatment with tenofovir should be suspended in any patient who develops clinical or laboratory findings suggestive of lactic acidosis or pronounced hepatotoxicity (which may include hepatomegaly and steatosis even in the absence of marked transaminase elevations). Discontinuation of anti-HBV therapy, including tenofovir, may be associated with severe acute exacerbations of hepatitis. Patients infected with HBV who discontinue tenofovir should be closely monitored with both clinical and laboratory follow-up for at least several months after stopping treatment. If appropriate, resumption of anti-hepatitis B therapy may be warranted. Tenofovir is principally eliminated by the kidney. Renal impairment, including cases of acute renal failure and Fanconi syndrome (renal tubular injury with severe hypophosphatemia), has been reported with the use of tenofovir disoproxil fumarate (see Undesirable Effects). It is recommended that creatinine clearance be calculated in all patients prior to initiating therapy and as clinically appropriate during therapy with tenofovir. In patients at risk of renal dysfunction, including patients who have previously experienced renal events while receiving adefovir dipivoxil, it is recommended that estimated creatinine clearance, serum phosphorus, urine glucose, and urine protein be assessed prior to initiation of tenofovir, and periodically during tenofovir therapy. Dosing interval adjustment of tenofovir and close monitoring of renal function are recommended in all patients with creatinine clearance below 50 mL/min (see Dosage and Administration). No safety or efficacy data are available in patients with renal impairment who received tenofovir disoproxil fumarate using these dosing guidelines, so the potential benefit of tenofovir therapy should be assessed against the potential risk of renal toxicity. Tenofovir should be avoided with concurrent or recent use of a nephrotoxic agent (e.g. high-dose or multiple non-steroidal anti-inflammatory drugs (NSAIDs)). Cases of acute renal failure after initiation of high dose or multiple NSAIDs have been reported in HIV-infected patients with risk factors for renal dysfunction who appeared stable on tenofovir DF. Some patients required hospitalization and renal replacement therapy. Alternatives to NSAIDs should be considered, if needed, in patients at risk for renal dysfunction. Tenofovir should not be used in combination with the fixed-dose combination products efavirenz/emtricitabine/tenofovir disoproxil fumarate, emtricitabine/rilpivirine/tenofovir disoproxil fumarate, elvitegravir/cobicistat/emtricitabine/tenofovir disoproxil fumarate or emtricitabine/tenofovir disoproxil fumarate since tenofovir disoproxil fumarate is a component of these products. Tenofovir should not be administered in combination with adefovir dipivoxil (see Warnings and Precautions - Drug interactions). Due to the risk of development of HIV-1 resistance, tenofovir should only be used in HIV-1 and HBV coinfected patients as part of an appropriate antiretroviral combination regimen. HIV-1 antibody testing should be offered to all HBV-infected patients before initiating therapy with tenofovir. It is also recommended that all patients with HIV-1 be tested for the presence of chronic hepatitis B before initiating treatment with tenofovir. Assessment of bone mineral density (BMD) should be considered for adults and pediatric patients who have a history of pathologic bone fracture or other risk factors for osteoporosis or bone loss. Although the effect of supplementation with calcium and vitamin D was not studied, such supplementation may be beneficial for all patients. If bone abnormalities are suspected, then appropriate consultation should be obtained. Cases of osteomalacia associated with proximal renal tubulopathy, manifested as bone pain or pain in extremities and which may contribute to fractures, have been reported in association with the use of tenofovir. Arthralgias and muscle pain or weakness have also been reported in cases of proximal renal tubulopathy. Hypophosphatemia and osteomalacia secondary to proximal renal tubulopathy should be considered in patients at risk of renal dysfunction who present with persistent or worsening bone or muscle symptoms while receiving products containing tenofovir DF. In HIV-infected adult subjects treated with tenofovir disoproxil fumarate in Study 903 through 144 weeks, decreases from baseline in BMD were seen at the lumbar spine and hip in both arms of trial. At week 144, there was a significantly greater mean percentage decrease from baseline in BMD at the lumbar spine in subjects receiving tenofovir disoproxil fumarate + lamivudine + efavirenz (-2.2% ± 3.9) compared with subjects receiving stavudine + lamivudine + efavirenz (-1.0% ± 4.6). Changes in BMD at the hip were similar between the two treatment groups (-2.8% ± 3.5 in the tenofovir disoproxil fumarate group vs. -2.4% ± 4.5 in the stavudine group). In both groups, the majority of the reduction in BMD occurred in the first 24–48 weeks of the trial and this reduction was sustained through Week 144. Twenty-eight percent of tenofovir disoproxil fumarate-treated subjects vs. 21% of the stavudine-treated subjects lost at least 5% of BMD at the spine or 7% of BMD at the hip. Clinically relevant fractures (excluding fingers and toes) were reported in 4 subjects in the tenofovir disoproxil fumarate group and 6 subjects in the stavudine group. In addition, there were significant increases in biochemical markers of bone metabolism (serum bone specific alkaline phosphatase, serum osteocalcin, serum C-telopeptide, and urinary N-telopeptide) in the tenofovir disoproxil fumarate group relative to the stavudine group, suggesting increased bone turnover. Serum parathyroid hormone levels and 1,25 Vitamin D levels were also higher in the tenofovir disoproxil fumarate group. Except for bone specific alkaline phosphatase, these changes resulted in values that remained within the normal range. In clinical trials evaluating tenofovir disoproxil fumarate in HIV-1 infected pediatric subjects 2 to less than 18 years of age, bone effects were similar to those observed in adult subjects. Under normal circumstances BMD increases rapidly in pediatric patients. In Study 352 (2 to less than 12 years), the mean rate of BMD gain in lumbar spine at Week 48 was similar between the tenofovir disoproxil fumarate and the d4T or AZT treatment groups. Total body BMD gain was less in the tenofovir disoproxil fumarate compared to the d4T or AZT treatment group. One tenofovir disoproxil fumarate-treated subject and none of the d4T or AZT-treated subjects experienced significant (greater than 4%) lumbar spine BMD loss at Week 48. Changes from baseline in BMD Z-scores were -0.012 for lumbar spine and -0.338 for total body in the 64 subjects who were treated with tenofovir disoproxil fumarate for 96 weeks. In Study 321 (12 to less than 18 years), the mean rate of BMD gain at Week 48 was less in the tenofovir disoproxil fumarate compared to the placebo treatment group. Six tenofovir disoproxil fumarate treated subjects and one placebo treated subject had significant (greater than 4%) lumbar spine BMD loss at Week 48. Changes from baseline BMD Z-scores were -0.341 for lumbar spine and -0.458 for total body in the 28 subjects who were treated with tenofovir disoproxil fumarate for 96 weeks. In both trials, skeletal growth (height) appeared to be unaffected. Markers of bone turnover in tenofovir disoproxil fumarate-treated pediatric subjects suggest increased bone turnover, consistent with the effects observed in adults. In a clinical trial (Study 115) conducted in pediatric subjects 12 to less than 18 years of age with chronic hepatitis B infection, both tenofovir and placebo treatment arms experienced an overall increase in mean lumbar spine BMD over 72 weeks, as expected for an adolescent population. The BMD gains from baseline to Week 72 in lumbar spine and total body BMD in tenofovir -treated subjects (+5% and +3%, respectively) were less than the BMD gains observed in placebo-treated subjects (+8% and +5%, respectively). Three subjects in the tenofovir group and two subjects in the placebo group had significant (greater than 4%) lumbar spine BMD loss at Week 72. At baseline, mean BMD Z-scores in subjects randomized to tenofovir were −0.43 for lumbar spine and −0.20 for total body, and mean BMD Z-scores in subjects randomized to placebo were −0.28 for lumbar spine and −0.26 for total body. In subjects receiving tenofovir for 72 weeks, the mean change in BMD Z-score was −0.05 for lumbar spine and −0.15 for total body compared to +0.07 and +0.06, respectively, in subjects receiving placebo. As observed in pediatric studies of HIV-infected patients, skeletal growth (height) appeared to be unaffected. The effects of tenofovir disoproxil fumarate-associated changes in BMD and biochemical markers on long-term bone health and future fracture risk are unknown. Cases of osteomalacia (associated with proximal renal tubulopathy and which may contribute to fractures) have been reported in association with the use of tenofovir disoproxil fumarate (see Undesirable Effects). Immune reconstitution syndrome has been reported in HIV-infected patients treated with combination antiretroviral therapy, including tenofovir disoproxil fumarate. During the initial phase of combination antiretroviral treatment, patients whose immune system responds may develop an inflammatory response to indolent or residual opportunistic infections , which may necessitate further evaluation and treatment. This section describes clinically relevant drug interactions with tenofovir disoproxil fumarate. Coadministration of tenofovir and didanosine should be undertaken with caution and patients receiving this combination should be monitored closely for didanosine-associated adverse reactions. Didanosine should be discontinued in patients who develop didanosine-associated adverse reactions. When administered with tenofovir disoproxil fumarate, Cmax and AUC of didanosine increased significantly. The mechanism of this interaction is unknown. Higher didanosine concentrations could potentiate didanosine-associated adverse reactions, including pancreatitis and neuropathy. Suppression of CD4+ cell counts has been observed in patients receiving tenofovir disoproxil fumarate (tenofovir DF) with didanosine 400 mg daily. In patients weighing greater than 60 kg, the didanosine dose should be reduced to 250 mg when it is coadministered with tenofovir. In patients weighing less than 60 kg, the didanosine dose should be reduced to 200 mg once daily when it is coadministered with tenofovir disoproxil fumarate. When coadministered, tenofovir and didanosine EC may be taken under fasted conditions or with a light meal (less than 400 kcal, 20% fat). For additional information on coadministration of tenofovir disoproxil fumarate and didanosine, please refer to the full prescribing information for didanosine. Tenofovir decreases the AUC and Cmin of atazanavir. When coadministered with tenofovir, it is recommended that atazanavir 300 mg is given with ritonavir 100 mg. Tenofovir should not be coadministered with atazanavir without ritonavir. Lopinavir/ritonavir, atazanavir coadministered with ritonavir, and darunavir coadministered with ritonavir have been shown to increase tenofovir concentrations. Tenofovir disoproxil fumarate is a substrate of Pglycoprotein (Pgp) and breast cancer resistance protein (BCRP) transporters. When tenofovir disoproxil fumarate is coadministered with an inhibitor of these transporters, an increase in absorption may be observed. Patients receiving tenofovir concomitantly with lopinavir/ritonavir, ritonavir-boosted atazanavir, or ritonavir-boosted darunavir should be monitored for tenofovir -associated adverse reactions. Tenofovir should be discontinued in patients who develop tenofovir -associated adverse reactions. Coadministration of tenofovir disoproxil fumarate and ledipasvir/sofosbuvir has been shown to increase tenofovir exposure (see Pharmacology). In patients receiving tenofovir concomitantly with ledipasvir/sofosbuvir without an HIV-1 protease inhibitor/ritonavir or an HIV-1 protease inhibitor/cobicistat combination, monitor for adverse reactions associated with tenofovir disoproxil fumarate. In patients receiving tenofovir concomitantly with ledipasvir/sofosbuvir and an HIV-1 protease inhibitor/ritonavir or an HIV-1 protease inhibitor/cobicistat combination, consider an alternative HCV or antiretroviral therapy, as the safety of increased tenofovir concentrations in this setting has not been established. If coadministration is necessary, monitor for adverse reactions associated with tenofovir disoproxil fumarate. Since tenofovir is primarily eliminated by the kidneys (see Pharmacology), coadministration of tenofovir disoproxil fumarate with drugs that reduce renal function or compete for active tubular secretion may increase serum concentrations of tenofovir and/or increase the concentrations of other renally eliminated drugs. Some examples include, but are not limited to cidofovir, acyclovir, valacyclovir, ganciclovir, and valganciclovir aminoglycosides (e.g., gentamicin), and high-dose or multiple NSAIDs. In the treatment of chronic hepatitis B, tenofovir should not be administered in combination with adefovir dipivoxil. There are no adequate and well-controlled studies in pregnant women. Because animal reproduction studies are not always predictive of human response, tenofovir should be used during pregnancy only if clearly needed. The Centers for Disease Control and Prevention recommend that HIV-1-infected mothers not breast-feed their infants to avoid risking postnatal transmission of HIV-1. Samples of breast milk obtained from five HIV-1 infected mothers in the first post-partum week show that tenofovir is excreted in human milk. The impact of this exposure in breastfed infants is unknown. Because of both the potential for HIV-1 transmission and the potential for serious adverse reactions in nursing infants, mothers should be instructed not to breast-feed if they are receiving TENVIR. The safety of tenofovir disoproxil fumarate in pediatric patients aged 2 to less than 18 years is supported by data from two randomized trials in which tenofovir disoproxil fumarate was administered to HIV-1 infected treatment-experienced subjects. In addition, the pharmacokinetic profile of tenofovir in patients 2 to less than 18 years of age at the recommended doses was similar to that found to be safe and effective in adult clinical trials. In Study 352, 92 treatment-experienced subjects 2 to less than 12 years of age with stable, virologic suppression on stavudine- or zidovudine-containing regimen were randomized to either replace stavudine or zidovudine with tenofovir disoproxil fumarate (N = 44) or continue their original regimen (N = 48) for 48 weeks. Five additional subjects over the age of 12 were enrolled and randomized (tenofovir disoproxil fumarate N=4, original regimen N=1) but are not included in the efficacy analysis. After 48 weeks, all eligible subjects were allowed to continue in the study receiving open-label tenofovir disoproxil fumarate. At Week 48, 89% of subjects in the tenofovir disoproxil fumarate treatment group and 90% of subjects in the stavudine or zidovudine treatment group had HIV-1 RNA concentrations less than 400 copies/mL. During the 48 week randomized phase of the study, 1 subject in the tenofovir disoproxil fumarate group discontinued the study prematurely because of virologic failure/lack of efficacy and 3 subjects (2 subjects in the tenofovir disoproxil fumarate group and 1 subject in the stavudine or zidovudine group) discontinued for other reasons. In Study 321, 87 treatment-experienced subjects 12 to less than 18 years of age were treated with tenofovir disoproxil fumarate (N=45) or placebo (N=42) in combination with an optimized background regimen (OBR) for 48 weeks. The mean baseline CD4 cell count was 374 cells/mm3 and the mean baseline plasma HIV-1 RNA was 4.6 log10 copies/mL. At baseline, 90% of subjects harbored NRTI resistance-associated substitutions in their HIV-1 isolates. Overall, the trial failed to show a difference in virologic response between the tenofovir disoproxil fumarate and placebo treatment groups. Subgroup analyses suggest the lack of difference in virologic response may be attributable to imbalances between treatment arms in baseline viral susceptibility to tenofovir disoproxil fumarate and OBR. Although changes in HIV-1 RNA in these highly treatment-experienced subjects were less than anticipated, the comparability of the pharmacokinetic and safety data to that observed in adults supports the use of tenofovir disoproxil fumarate in pediatric patients 12 years of age and older who weigh greater than or equal to 35 kg and whose HIV-1 isolate is expected to be sensitive to tenofovir disoproxil fumarate. (See Warnings and Precautions, Undesirable Effects and Pharmacology). Safety and effectiveness of tenofovir disoproxil fumarate in pediatric patients younger than 2 years of age with HIV-1 infection have not been established. In Study 115, 106 HBeAg negative (9%) and positive (91%) subjects aged 12 to less than 18 years with chronic HBV infection were randomized to receive blinded treatment with tenofovir disoproxil fumarate 300 mg (N = 52) or placebo (N = 54) for 72 weeks. At study entry, the mean HBV DNA was 8.1 log10 copies/mL and mean ALT was 101 U/L. Of 52 subjects treated with tenofovir disoproxil fumarate, 20 subjects were nucleos(t)ide-naïve and 32 subjects were nucleos(t)ide-experienced. Thirty-one of the 32 nucleos(t)ide-experienced subjects had prior lamivudine experience. At Week 72, 88% (46/52) of subjects in the tenofovir disoproxil fumarate group and 0% (0/54) of subjects in the placebo group had HBV DNA <400 copies/mL. Among subjects with abnormal ALT at baseline, 74% (26/35) of subjects receiving tenofovir disoproxil fumarate had normalized ALT at Week 72 compared to 31% (13/42) in the placebo group. One tenofovir disoproxil fumarate -treated subject experienced sustained HBsAg-loss and seroconversion to anti-HBs during the first 72 weeks of study participation. Safety and effectiveness of tenofovir disoproxil fumarate in pediatric patients younger than 12 years of age or less than 35 kg with chronic hepatitis B have not been established. Clinical trials of tenofovir did not include sufficient numbers of subjects aged 65 and over to determine whether they respond differently from younger subjects. In general, dose selection for the elderly patient should be cautious, keeping in mind the greater frequency of decreased hepatic, renal, or cardiac function, and of concomitant disease or other drug therapy. It is recommended that the dosing interval for TENVIR be modified in patients with creatinine clearance below 50 mL/min or in patients with ESRD who require dialysis (see Dosage and Administration, Pharmacology). Lactic Acidosis/Severe Hepatomegaly with Steatosis (see Boxed Warning, Warnings and Precautions). Severe Acute Exacerbation of Hepatitis (see Boxed Warning, Warnings and Precautions). New Onset or Worsening Renal Impairment (see Warnings and Precautions). Decreases in Bone Mineral Density (see Warnings and Precautions). Immune Reconstitution Syndrome (see Warnings and Precautions). More than 12,000 subjects have been treated with tenofovir disoproxil fumarate alone or in combination with other antiretroviral medicinal products for periods of 28 days to 215 weeks in clinical trials and expanded access programs. A total of 1,544 subjects have received tenofovir disoproxil fumarate 300 mg once daily in clinical trials; over 11,000 subjects have received tenofovir disoproxil fumarate in expanded access programs. Study 903 - Treatment-Emergent Adverse Reactions: The most common adverse reactions seen in a double-blind comparative controlled trial in which 600 treatment-naïve subjects received tenofovir disoproxil fumarate (N=299) or stavudine (N=301) in combination with lamivudine and efavirenz for 144 weeks (Study 903) were mild to moderate gastrointestinal events and dizziness. Mild adverse reactions (Grade 1) were common with a similar incidence in arms, and included dizziness, diarrhea and nausea. Selected treatment-emergent moderate to severe adverse reactions are summarized in Table 4.
a Frequencies of adverse reactions are based on all treatment-emergent adverse events, regardless of relationship to study drug. b Lipodystrophy represents a variety of investigator-described adverse events not a protocol-defined syndrome. c Peripheral neuropathy includes peripheral neuritis and neuropathy. d Rash event includes rash, pruritus, maculopapular rash, urticaria, vesiculobullous rash, and pustular rash. With the exception of fasting cholesterol and fasting triglyceride elevations that were more common in the stavudine group (40% and 9%) compared with tenofovir disoproxil fumarate (19% and 1%) respectively, laboratory abnormalities observed in this trial occurred with similar frequency in the tenofovir disoproxil fumarate and stavudine treatment arms. A summary of Grade 3 - 4 laboratory abnormalities is provided in Table 5. In Study 934, 511 antiretroviral-naïve subjects received either tenofovir disoproxil fumarate + emtricitabine administered in combination with efavirenz (N=257) or zidovudine/lamivudine administered in combination with efavirenz (N=254). Adverse reactions observed in this trial were generally consistent with those seen in previous studies in treatment-experienced or treatment-naïve subjects (Table 6). In HIV-1 infected adult subjects in Study 903, there was a significantly greater mean percentage decrease from baseline in BMD at the lumbar spine in subjects receiving tenofovir disoproxil fumarate + lamivudine + efavirenz (-2.2% ± 3.9) compared with subjects receiving stavudine + lamivudine + efavirenz (-1.0% ± 4.6) through 144 weeks. Changes in BMD at the hip were similar between the two treatment groups (-2.8% ± 3.5 in the tenofovir disoproxil fumarate group vs. -2.4% ± 4.5 in the stavudine group). In both groups, the majority of the reduction in BMD occurred in the first 24-48 weeks of the trial and this reduction was sustained through Week 144. Twenty-eight percent of tenofovir disoproxil fumarate -treated subjects vs. 21% of the stavudine-treated subjects lost at least 5% of BMD at the spine or 7% of BMD at the hip. Clinically relevant fractures (excluding fingers and toes) were reported in 4 subjects in the tenofovir disoproxil fumarate group and 6 subjects in the stavudine group. In addition, there were significant increases in biochemical markers of bone metabolism (serum bone-specific alkaline phosphatase, serum osteocalcin, serum C telopeptide, and urinary N telopeptide) and higher serum parathyroid hormone levels and 1,25 Vitamin D levels in the tenofovir disoproxil fumarate group relative to the stavudine group; however, except for bone-specific alkaline phosphatase, these changes resulted in values that remained within the normal range [(See Warnings and Precautions). b From Weeks 96 to 144 of the trial, subjects received tenofovir disoproxil fumarate/ emtricitabine with efavirenz in place of tenofovir disoproxil fumarate + emtricitabine with efavirenz. c Rash event includes rash, exfoliative rash, rash generalized, rash macular, rash maculo-papular, rash pruritic, and rash vesicular. a From Weeks 96 to 144 of the trial, subjects received tenofovir disoproxil fumarate/emtricitabine with efavirenz in place of tenofovir disoproxil fumarate + emtricitabine with efavirenz. Treatment-Emergent Adverse Reactions: The adverse reactions seen in treatment experienced subjects were generally consistent with those seen in treatment naïve subjects including mild to moderate gastrointestinal events, such as nausea, diarrhea, vomiting and flatulence. Less than 1% of subjects discontinued participation in the clinical trials due to gastrointestinal adverse reactions (Study 907). A summary of moderate to severe, treatment-emergent adverse reactions that occurred during the first 48 weeks of Study 907 is provided in Table 8.
b Peripheral neuropathy includes peripheral neuritis and neuropathy. c Rash event includes rash, pruritus, maculopapular rash, urticaria, vesiculobullous rash, and pustular rash. Laboratory abnormalities observed in this trial occurred with similar frequency in the tenofovir disoproxil fumarate and placebo-treated groups. A summary of Grade 3 - 4 laboratory abnormalities is provided in Table 9. Assessment of adverse reactions is based on one randomized trials (Study 352 and 321) in 184 HIV-1 infected pediatric subjects (2 to less than 18 years of age) who received treatment with tenofovir disoproxil fumarate (N=93) or placebo/active comparator (N=91) in combination with other antiretroviral agents for 48 weeks. The adverse reactions observed in subjects who received treatment with tenofovir disoproxil fumarate were consistent with those observed in clinical trials in adults. Bone effects observed in pediatric subjects 2 years of age and older were consistent with those observed in adult clinical trials (See Warnings and Precautions). Eighty-nine pediatric subjects received tenofovir disoproxil fumarate in Study 352 (48 who were initially randomized to tenofovir disoproxil fumarate and 41 who were initially randomized to continue stavudine or zidovudine and then received tenofovir disoproxil fumarate in the extension phase) for a median exposure of 104 weeks. Of these, 4 subjects discontinued from the trial due to adverse reactions consistent with proximal renal tubulopathy. Three of these 4 subjects presented with hypophosphatemia and also had decreases in total body or spine BMD Z score (See Warnings and Precautions). In controlled clinical trials in 641 subjects with chronic hepatitis B (0102 and 0103), more subjects treated with tenofovir disoproxil fumarate during the 48-week double-blind period experienced nausea: 9% with tenofovir versus 2% with adefovir dipivoxil. Other treatment-emergent adverse reactions reported in more than 5% of subjects treated with tenofovir disoproxil fumarate included: abdominal pain, diarrhea, headache, dizziness, fatigue, nasopharyngitis, back pain and skin rash. During the open-label phase of treatment with tenofovir disoproxil fumarate (weeks 48–384) in Studies 0102 and 0103, 2% of subjects (13/585) experienced a confirmed increase in serum creatinine of 0.5 mg/dL from baseline. No significant change in the tolerability profile was observed with continued treatment for up to 384 weeks. A summary of Grade 3 and 4 laboratory abnormalities through Week 48 is provided in Table 10. Grade 3-4 laboratory abnormalities were similar in subjects continuing tenofovir disoproxil fumarate treatment for up to 384 weeks in these trials. The overall incidence of on-treatment ALT elevations (defined as serum ALT greater than 2 × baseline and greater than 10 × ULN, with or without associated symptoms) was similar between tenofovir disoproxil fumarate (2.6%) and adefovir dipivoxil (2%). ALT flares generally occurred within the first 4–8 weeks of treatment and were accompanied by decreases in HBV DNA levels. No subjects had evidence of decompensation. ALT flares typically resolved within 4 to 8 weeks without changes in study medication. The adverse reactions observed in subjects with chronic hepatitis B and lamivudine resistance who received treatment with tenofovir disoproxil fumarate were consistent with those observed in other hepatitis B clinical trials in adults. In a small randomized, double-blind, active-controlled trial (0108), subjects with CHB and decompensated liver disease received treatment with tenofovir disoproxil fumarate or other antiviral drugs for up to 48 weeks. Among the 45 subjects receiving tenofovir disoproxil fumarate, the most frequently reported treatment-emergent adverse reactions of any severity were abdominal pain (22%), nausea (20%), insomnia (18%), pruritus (16%), vomiting (13%), dizziness (13%), and pyrexia (11%). Two of 45 (4%) subjects died through Week 48 of the trial due to progression of liver disease. Three of 45 (7%) subjects discontinued treatment due to an adverse event. Four of 45 (9%) subjects experienced a confirmed increase in serum creatinine of 0.5 mg/dL (1 subject also had a confirmed serum phosphorus less than 2mg/dL through Week 48). Three of these subjects (each of whom had a Child-Pugh score greater than or equal to 10 and MELD score greater than or equal to 14 at entry) developed renal failure. Because both tenofovir and decompensated liver disease may have an impact on renal function, the contribution of tenofovir to renal impairment in this population is difficult to ascertain. One of 45 subjects experienced an on-treatment hepatic flare during the 48 Week trial. Assessment of adverse reactions is based on one randomized study (Study GS-US-174-0115) in 106 pediatric subjects (12 to less than 18 years of age) infected with chronic hepatitis B receiving treatment with tenofovir disoproxil fumarate (N = 52) or placebo (N = 54) for 72 weeks. The adverse reactions observed in pediatric subjects who received treatment with tenofovir disoproxil fumarate were consistent with those observed in clinical trials of tenofovir disoproxil fumarate in adults. In this study, both the tenofovir disoproxil fumarate and placebo treatment arms experienced an overall increase in mean lumbar spine BMD over 72 weeks, as expected for an adolescent population. The BMD gains from baseline to Week 72 in lumbar spine and total body BMD in tenofovir disoproxil fumarate -treated subjects (+5% and +3%, respectively) were less than the BMD gains observed in placebo-treated subjects (+8% and +5%, respectively). Three subjects in the tenofovir disoproxil fumarate group and two subjects in the placebo group had significant (greater than 4%) lumbar spine BMD loss at Week 72. At baseline, mean BMD Z-scores in subjects randomized to tenofovir disoproxil fumarate were −0.43 for lumbar spine and −0.20 for total body, and mean BMD Z-scores in subjects randomized to placebo were −0.28 for lumbar spine and −0.26 for total body. In subjects receiving tenofovir disoproxil fumarate for 72 weeks, the mean change in BMD Z-score was −0.05 for lumbar spine and −0.15 for total body compared to +0.07 and +0.06, respectively, in subjects receiving placebo. As observed in pediatric studies of HIV-infected patients, skeletal growth (height) appeared to be unaffected (see Warnings and Precautions). The following adverse reactions have been identified during post approval use of tenofovir disoproxil fumarate. Because postmarketing reactions are reported voluntarily from a population of uncertain size, it is not always possible to reliably estimate their frequency or establish a causal relationship to drug exposure. Pancreatitis, increased amylase, abdominal pain. Hepatic steatosis, hepatitis, increased liver enzymes (most commonly AST, ALT gamma GT). Rhabdomyolysis, osteomalacia (manifested as bone pain and which may contribute to fractures), muscular weakness, myopathy. Acute renal failure, renal failure, acute tubular necrosis, Fanconi syndrome, Proximal renal tubulopathy, interstitial nephritis (including acute cases), nephrogenic diabetes insipidus, renal insufficiency, increased creatinine, proteinuria, polyuria. Limited clinical experience at doses higher than the therapeutic dose of tenofovir disoproxil fumarate 300 mg is available. In Study 901, 600 mg tenofovir disoproxil fumarate was administered to 8 subjects orally for 28 days. No severe adverse reactions were reported. The effects of higher doses are not known. Tenofovir is efficiently removed by haemodialysis with an extraction coefficient of approximately 54%. Following a single 300 mg dose of tenofovir disoproxil fumarate, a four-hour haemodialysis session removed approximately 10% of the administered tenofovir dose.